This addition to the January sales window brought all the major constructors to South Africa in 1976. Chevron had two brand new Chevron B34s in South Africa, one for local Tony Martin and the second for visiting Canadian champion Bill Brack while reigning champion Dave Charlton had chosen a Modus M3 from Teddy Savoury's ambitious operation and March were represented by Ian Scheckter in a new March 76B. Newer constructors also had a stake: Ralt had a new RT1 in the hands of Roy Klomfass and Alex Blignault had bought a new Wheatcroft R18 for Nols Nieman to drive. Scheckter immediately proved quickest, taking pole position in each of the six races before the mid-winter break and winning four of those. The Chevron B34s were initially his closest competition but it was Roy Klomfass and the Ralt that first interrupted his winning sequence, taking the chequered flag at Aldo Scribante in March and again at Brandkop in May. 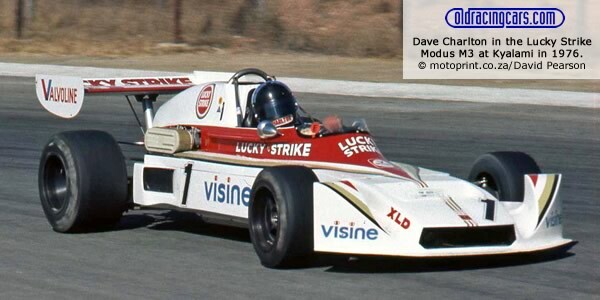 Charlton's Modus was no match for the March and in August he bought a 76B of his own, then winning at Kyalami in October and taking pole at Killarney two weeks later, the only time all season that Scheckter was beaten in practice. Points table from Autocourse 1976-77 p249. The formal name of the championship was the Philips Car Sound Atlantic Championship but historically this was the South African Drivers Championship and was organised by the South African Motor Racing Club (SAMRaC).